Does the new Back Bay/South End Gateway project preclude the construction of a new Green Line station as part of the E Branch realignment discussed in this thread?Constructing the station under the garage footprint as part of a redevelopment seems like a good approach, but I'm not sure of conflicts between that alignment and a) this project's foundation and b) Copley Place foundation. Is the Turnpike the only feasible alignment? I don't think anyone at the MBTA is seriously considering an E train extension through Back Bay. They would be happy just to get the GLX built on time and on budget first. My original question still stands. Does this development preclude E branch realignment discussed in this thread? Possibly it would be hard to say without studying potential alignments and it also depends on if it would need to be next to the pike or if the tunnel could go directly underneath the pike at this point. Did anyone ever hear the phrase "Perfect is the enemy of the good" ...? Abandon Symphony and Prudential stations (did I say that? Yes I did) and maintain the E surface reservation through to Stuart Street, using the Mass Ave underpass. Eat the two lanes of street parking on Stuart with a continued transit reservation. Continue onto Kneeland, which is easily wide enough to accommodate a center reservation. Turn north onto Surface Road, eating street parking and one travel lane to bring you to to the point that F-Line has called the holy-grail of Silver Line tunnel insertion, at Essex Street. With signal priority, this routing will not be hellatious. You will probably get a connection from Back Bay to the Seaport at less than 10% of the cost of any tunneling. Also, you get it in one phase, without first needing to open the roundabout Boylston-Seaport-via-Pike connector. Your proposal would be to connect the E line to the Seaport via Stuart instead of its current connection to the Green Line subway. If this would be done you would want to make sure that the new Silver E Line has connections to the Green and Orange Lines. I had been playing around with a Silver Line portal on the short block of Ave De Lafayette between Kingston and Chauncy Streets. In my scheme the Silver Line would loop around Washington to Tremont in order to enter a new enclosed fare controlled surface Boylston station. This would add an accessible entrance to Boylston and create a great connection to the Silver Line. The loop would then have a traditional surface stop at Chinatown for Orange Line connections (or a pedestrian tunnel could connection Boylston to Chinatown). 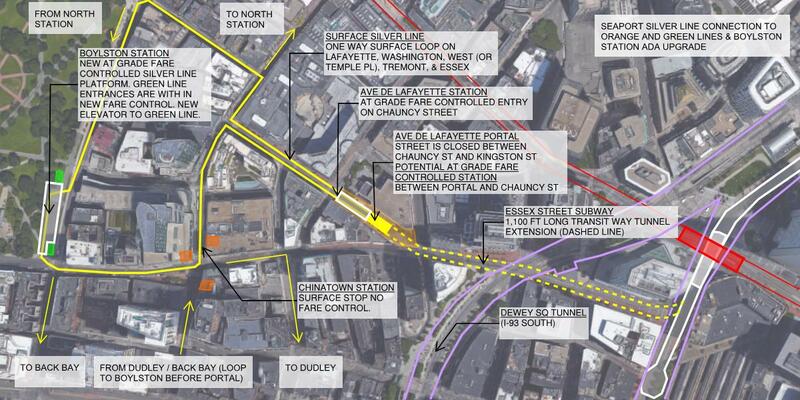 The new surface E Line could also make this loop and enter into the De Lafayette portal to the Seaport. http://streetmix.net/-/350977 - Where there isn't a station, parking or turning lanes replaces the platform. Bigger problem would I think be Surface Road, which is actually from property-line to property-line just as narrow, and would probably need more than a single lane of traffic. I suppose it could fit two lanes, but wouldn't allow any stations on that stretch. 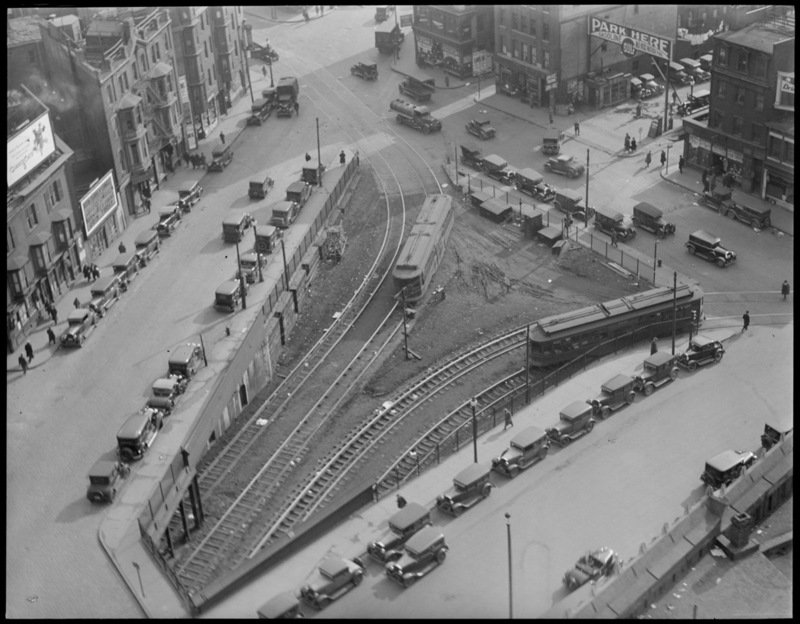 Here is an image I found online which shows the former Tremont Street Subway portal at the current Elliot Norton Park. As reactivating the Tremont Street Subway is discussed in many Green Line reconfiguration proposals, I thought people would find this image interesting. This is a great picture and I think we've seen it before on here, but thanks for sharing! It makes me wonder how much of the tunnel/portal is reusable, and how much work would be needed if they were to re-activate it. 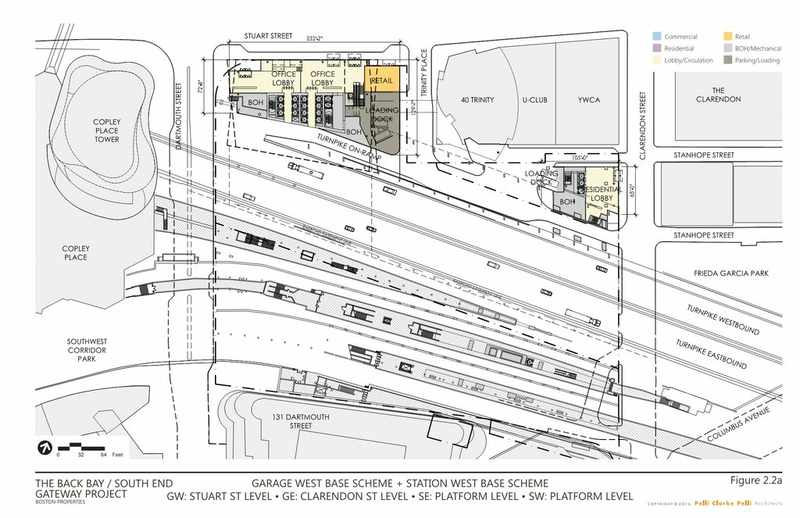 The fact that it is 4 tracks and a flying junction means it would provide a lot of benefit if greenline down Washington St. and/or towards Seaport were ever realized. I've never seen that incredible photo before, so thanks! All of it is reusable. In 1975 the portal had a bare concrete wall poured at the end of it right about where you see the last support girders in that picture, and then the 'wedge' incline was simply dumped full of soil to make Eliot Norton Park. The walled-off portal is located right here...right underneath that dead-center tree abutting the playground chain-link fence. To orient self overhead, compare Historic Aerials 1969 shot vs. 2012 shot. No obstructions anywhere on the park now that the former church building is condemned. The soft soil backfill on the former incline was only so they could plant the park; it's not firm enough to support any new building development (which is why the church had so many fatal structural problems). Strip all hardware bare from floor-to-ceiling and wall-to-wall. Sandblast + patch walls, upgrade drainage channels to modern regs, re-equip with all-new clean utility lines. Refurb and strengthen the steel on the flyover ramps to handle the weight of modern LRV's. Even if you're only using 2 tracks for new service, the flyovers get used by 1 direction any which way so all of the ramps have to get weight-uprated. New track infrastructure. Rail, ties, ballast, overhead wire, signals, switches, etc. Substation upgrades elsewhere on the Central Subway to feed the electrical. ADA Boylston Station for the increased traffic. It can be done without harming any historic structures. That's an incorrectly-cited reason for its ADA exemption, since Boylston has had many structural and cosmetic mods over the decades...with significant changes happening as late as 1950's-1970's. Expense of relocating electrical substation infrastructure and staff space to create room + proximity to the far Park St. entrance are the reasons that justified the exemption within the station's current traffic levels. That exemption no longer holds if it becomes a big transfer station to a new branch or Silver Line Phase III. That's it for the pre-existing infrastructure. It's a gut/rebuild at the going rate for that, but no actual modifications to any of the original 1897 underground steel and concrete other than rolling back the clock. Tunnel dimensions are exactly the same as the rest of the original subway so it completely fits Type 7's/8's/9's, and the abandoned tunnel's trajectory is much straighter than that nasty curve upstairs so the trolleys traditionally zipped much faster from Boylston platform to South End portal than they do today in the tunnel between Boylston and Arlington. Next steps are all about where you choose to go from there. Obviously you're not re-digging the incline stet and getting rid of the park, so it now becomes a choose-your-adventure of where you tunnel next. Tremont St. is much wider and less impactful of surrounding buildings if you're continuing on towards the Pike. In all likelihood you're going to bank to that side of least-resistance rather than continuing straight down Oak. Tremont would handle continuation of the 4-track tunnel without building impacts if you plan to split future branchlines at the Pike. Probably best to not be penny-wise/pound-foolish; build it quad from Day 1. If only 2 tracks are being used for revenue service, then the other 2 tracks can get good immediate non-revenue use as an interim North Station-style layover yard for short-turning GLX service. Room for plunking a Tufts station here would thus come from stretching diagonally across the park corner-to-corner where there's a solid 350 ft. of space to tap for a widened-out station. As a 4-tracker from Day 1 or as provision for activating the other 2 tracks later you'd probably want to set up the station sort of like Park St. with twin island platforms. Only unlike Park, where each island handles service in 1 direction, the way the tracks split here the two islands would each go inbound-outbound, inbound-outbound like JFK on the Red Line. No way to change that, because the track split is what it is...and because these are Green headways you probably won't get the same chaotic stampedes of passengers for each sparse-headway train that makes JFK platform flow such a clownshow. As with the tunnel extension, future-proof it by carving out all the platform space even if only 2 tracks are going to be used initially for revenue service. As before, Tracks 3 & 4 make an excellent turnback spot and layover yard in the interim. Do up the second platform strictly for short-turns, or fence off the empty space and leave that side strictly for non-revenue parking. Up-and-over access between platforms via the upstairs headhouse in the park. Probably can brilliantly daylight the whole thing under glass even grander than new Gov't Center because it's so shallow below the park. Snake a duck-under passageway below the platforms across the street to pick up the nearest insertion point to the Orange Line Tufts lobby...re-jiggering things on the Orange mezzanine so the connection is behind fare control. Don't know exactly what preferred trajectory would be for that walkway, but there are multiple feasible and low-impact paths for linking the station lobbies across the Tremont-Washington block so configuration is not a matter of "if" but "which way". Everything else is where you go once you hit Marginal St.
Bang a left under Marginal for South Station and the Seaport, crossing under the Orange tunnel at a clean angle on the Oak/Marginal corner. Then whatever trajectory best suits the injection point into the Transitway (blah blah whole other multi-page discussion we've had before). Bang left as above, but fork a diverging side tunnel diagonally under the Pike for your Silver Line-Dudley light rail replacement. Portal-up on the NEC slack space under the Shawmut overpass formerly occupied by the Boston Herald freight siding turnout. Move some Amtrak electrical boxes and graft an incline up the Herald St. retaining wall to the Washington St. intersection, plant a trolley signal phase at the traffic light, and off you go to Dudley Sq. You can either use Tracks 3 & 4 for this, or do a simpler at-grade junction from Tks. 1 & 2 splitting from the Seaport branch and save 3 & 4 for short-turns or something ↓grander↓ later. Dudley's never going to have headways so thick that it'll create a bottleneck here, so that's far and away the last service pattern you'd ever want to overthink to boondogglery re: quantity of tunnel concrete at the track split. Notch a turnout in the tunnel wall on that Tremont/Marginal corner for banging a right to Back Bay station. You can add this later--at your leisure in whatever decade funding permits--as a replacement for Copley Jct. and re-routing the E (with BBY transfer now in-tow) through Tracks 3 & 4 to solve the Central Subway's biggest west-end traffic bottleneck and capacity limiter. Huge potential traffic draw, fully meriting the Track 3 & 4 capacity if/when it gets built. Again...don't be pound-foolish. Just build a little notch in the wall and widened-out spot underneath the Marginal/Tremont traffic island for a rainy day so Tracks 3 & 4 can feed that route in the future if needed...and allow for a run-thru junction between the BBY route and your routes to SS/Seaport or Dudley to keep butts covered on alternate service patterns. A little inexpensive prevention by hollowing out the extra room under that traffic island offers up a lot of very flexible options to use, not use, far-future use...whatever. You could actually restore Boylston to closer to its original 1897 configuration with the ADA mods. It was built with four headhouses, but the northern headhouse on each platform was removed back in the 60s. Rebuild those about ten feet south of their original locations, plunk two elevator shafts in each, and raise the platform floor, and you can have the station ADA'd without laying a hand on the historically significant elements. Might even be worth restoring the passageway to the Little Building to let passengers avoid crossing Boylston. Boylston is actually probably the easiest of all the subway stations to retrofit. Other than the Little Building passage, none of it is under streets or has structural impacts on buildings. It's two one-directional platforms, with no complicated passages. The outer tracks give you some staging area to work with to avoid having to block the main tracks. You could probably rip up the sidewalk, put a big tent over top, and do the entire operation in one construction season without even closing the station on weekdays. Just do the concrete one section at a time and use temporary stairs when needed. It's going to take a solid 15-20 years to pick up the ashes from Silver Line Phase III and do all the back-breaking work on study + design + community input + funding of that Seaport-downtown connector before shovels go in ground on that build. In the meantime, there's no alternative but to buy time by front-loading easier congestion mitigation projects like Red-Blue, resignaling Red + Orange, and ped flow improvements at Park and DTX to mitigate the platform dwell issues. Going through the South End is a tale of two degrees of difficulty. It's very easy and straightforward to refurb the tunnel, build a Tufts station under Eliot Norton Park, and do 1 block's worth of 4-track tunneling under 75 ft. wide Tremont St. to the Marginal intersection on land that was urban-renewal nuked in the mid-1960's. It's brutally difficult to snake around to the Transitway. Maybe orders-of-magnitude more feasible on a South End routing with trolley tunnel rather than Essex St. with crippled BRT, but make no mistake...it's a HARD and EXPENSIVE project to engineer. It may be a lot easier, then, to break this project into phases by front-loading this "easy" build area in conjunction with converting Washington St. to trolley. That may be the secondary-importance branch here, but it clears away all the straightforward tunnel construction in more bite-size fashion buying more time for the more expensive and time-consuming slog to the Transitway. Building all the infrastructure to the Tremont/Marginal intersection + the Dudley branch split still offers enormous downtown congestion mitigation buying more time to complete the SS/Seaport connector. By flanking the Orange Line with Green transfers at both north and south bookends of the most crowded downtown stations it significantly lightens the load and dwell time decay at maximum-concern State + DTX, which in turn gives Red a little more relief at DTX. This matters a lot. Run the Medford Branch through to Dudley to jump-start Tufts transfer and this first phase of tunnel build and the big project to SS/Seaport can be staggered out into less overwhelming chunks while offering some earlier return-on-investment. Secondly, MassDOT is sitting on high-value real estate right next door that can underwrite the cost of this Phase I: those cursed Pike air rights that have been sitting vacant for 50 years. Clean up this institutional Three Stooges Act that that keeps anything from happening here, and get SERIOUS about filling up the whole of the Clarendon to Albany parcels with the highest-value real estate left in town. Clean out all the rank incompetence that has prevented the state, City Hall, and BRA from getting anything done. Have a compelling master plan to get those parcels moving. This underwrites statistically significant portion of the cost of the transit expansion from Boylston to any points along Marginal St. The development extends a cycle track + walking path continuation of SW Corridor Park along one side of the buildings to Albany St. where it can jump under the South Bay ramps onto connection with the Harborwalk (and new footbridges connecting both sides of the Channel. Pru Mall interior walkway continues its meander skywalk-by-skywalk across every new block's worth of development to become fully contiguous from Hynes station/Mass Ave. at that new tower to Albany St. Becoming Boston's equivalent to D.C.'s Crystal City. Pru/Copley, Boylston St., and Ink Block developments all get joined together in a string of pearls by this air rights master plan, juicing Ink Block's value and utilization enough to explode the rapid transit demand to Tufts and the inner portion of the Dudley Branch. All of this should have a financing plan where air rights fees and rent collected from the developers at this primo parcels pays off the debt service on this Phase I transit build, and also starts building a lockbox funding source for completing the Copley Jct. relocation through BBY which also shares most of its route running along these new air rights towers. As this revenue source is sustainable over the long-term, it will help amortize the build costs in a way where the financing can draw from more sources than just a one-time construction infusion. Get an interest rate when structuring the air rights package that keeps its promises. Also...financing it with sustainable revenue streams helps protect them if some air rights parcels hit delays (hopefully not all of them, and most definitely not with the Three Stooges planning institutions snatching defeat from the jaws of victory on all of the parcels like the last 50 years). The only part of the builds that are outside the air rights funding mechanism are the ones that depart the neighborhood: Washington St. light rail (not expensive in absolute terms), and the SS/Seaport connector once it leaves the air rights corridor after Harrison. That one's still going to cost over a billion dollars to get the rest of the way...but it's a hell of a lot less to appropriate if the air rights underwriting can offset big chunk of the costs along Marginal St. Including a possible Ink Block intermediate station spanning Washington-Harrison by the tennis courts. Doing transit that transformative requires similar boldness and vision with the financing. Well...they're sitting on a goldmine literally at the curb they'll be digging under on Marginal St., with air rights already under the auspices of MassDOT. Use it for all it's worth. Certainly would be a big sea change from 50 years of our intrepid planning institutions sqandering it for all it's worth. Continuing the idea of completing the full Green Line to Transit Way build incrementally, perhaps building the Transit Way tunnel from the existing bellmouth at Essex Street to an Ave De Lafayette portal could be financed in the not too distant future. If a portal were possible here it would provide significant improvement to the Seaport Silver Line and would complete the first necessary tunneling en route to the Tremont Street subway for future Green Line conversion. A portal is not possible there. The Silver Line portal, retaining wall-to-retaining wall, is 50 ft. wide. Ave. de Lafayette, building foundation-to-building foundation, is 55 ft. wide. Are we going to get rid of the sidewalks too so the ground-floor retail at 11 AdL can't function and the service entrance to that tall building on the corner is sealed? No...never. The safety issues alone to pinching emergency access to those buildings would kill any portal placement on this street deader than dead. They already threw a half-dozen darts at the wall in desperation with SL III looking for ways to stage it with mid-line portals on the Essex alignment. All of them were 1000% nonstarters. You won't find a viable one east of the Public Gardens no matter how hard you try. It's already been squinted at by real project planners until they went blind. The link above allows you to overlay aerials and maps from various times on a current aerial. If you click the arrow in the bottom center of the screen the overlay options expand. If you look at the 1969 aerial this part of Ave De Lafayette was not yet built. The whole area was cleared in the 1970s. With this history and the fact that this block does not provide a unique vehicular or particularly pleasant pedestrian connection, closing this block of Ave De Lafayette does not seem too implausible. I envision the portal being part of a fare controlled transit station. The east end would be closed to pedestrians and would have the more severe slope, the west end adjacent to Chauncy Street would have the (2% or less slope) pedestrian BRT platforms. The retail access at 11 Ave De Lafayette would have to be re-imagined, it could be accessed from Chauncy Street or perhaps the first floor of this building is part of the transit station (fare lobby, retail, etc). The garage door into the industrial building to the north of the portal would need to be relocated. Perhaps this building is redeveloped with air rights over the portal and transit station. The whole block would be re-imagined into something quite interesting. Imagine exiting the new De Lafayette station and seeing the marque of the Opera House directly in front of you at the end of the street. My biggest technical concern is will the length of the portal incline extend past Chauncy Street. If so, this proposal starts to get quite disruptive to the neighborhood. Last edited by Upstruk; 06-07-2016 at 10:39 PM. All of that re-imagining Lafayette blah blah blah is totally irrelevant. Because the issue isn't when the street was built and whether car traffic can be diverted. The issue is that the portal incline footprint is physically wider than the street itself and requires cannibalizing the sidewalks in front of building entrances to shiv in a portal. Storefronts get put out of business, a large new building gets deprived of its service entrance, and building access is totally blocked to emergency vehicles and personnel. This is not just infeasible and not just impossible to stand up to the lawsuits from those building owners and tenants...but it's flagrantly illegal for city fire codes and will never be granted an engineering permit. No permit = done...The End...start all over again. Needing to break fire safety laws in the same neighborhood of narrow streets that was torched by the Great Boston Fire of 1872 should be the very first indication that a mid-line portal is not going to work. Dozens of BRT portal alignments and half-build portal alignments have been thrown at a dartboard by people on the official project payroll. All of them failed the feasibility test. If you're attempting to troubleshoot the project, you have to take into account WHY all those portal alignments failed and come up with a build that directly addresses and neutralizes every one of those flaws that killed all prior alignments. Not try to one-up the project staff and all their rejected alignments by raising the stakes even further on engineering difficulty. That's not proposing a solution that can exist in the real world for a transit connection that is not a Crazy Transit Pitch, but an unfunded mandate that was supposed to have been built by now. 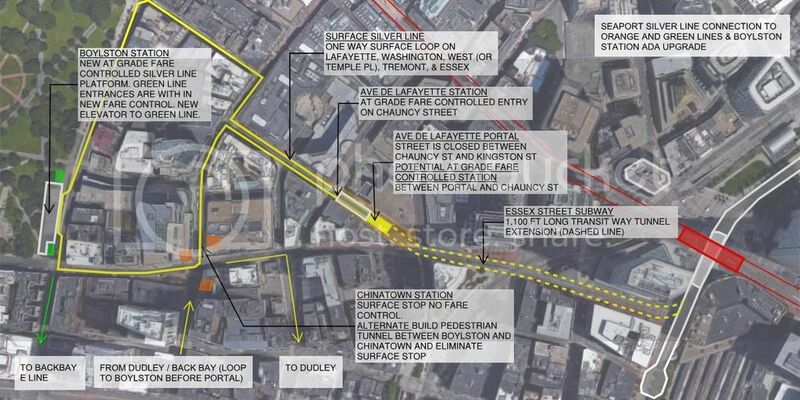 I would love to read about the reviewed and rejected portal options between South Station and the Common. I have found these options for portals after Boylston but nothing for before. I am also interested in the 50 ft wide portal requirement. I see that the Chelsea Silver Line surface Busway is 30ft. What goes into the additional 20ft for a portal? If this portal were explored further the State may want to buy the two adjacent properties and then resell them with air rights over the former Ave De Lafayette right of way. The Building Code does give increases to the allowable floor area of a building based on street frontage length. The building in question is likely Type III construction (exterior is non combustible and interior is combustible). The street frontage loss would affect the buildings allowable area per floor. Doing a quick code analysis it looks like a fully sprinklered Type III A office building with no street frontage bonus could have 57,000 SF per floor. This is larger than the building in question.